The perfect appetizer for entertaining! 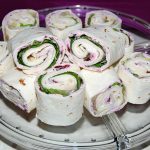 These beautiful pinwheels are stuffed with cream cheese, cranberry salsa, sliced turkey, Swiss cheese, tomato and romaine lettuce, Enjoy! In a small bowl, beat the softened cream cheese and cranberry sauce together until combined. Spread 1/4 of the cranberry/cream cheese mixture over a tortilla all the way to the edges. Lay lettuce leaves down the center of the tortilla, Layer two slices of turkey and two slices of Swiss cheese over the lettuce. Top with slices of tomato if using. Starting at one edge of the wrap, roll tightly around the filling into a cylinder. Wrap each roll-up tightly in plastic wrap. Continue with remaining tortillas. Chill wrapped roll-ups in the refrigerator at least 30 minutes before serving. 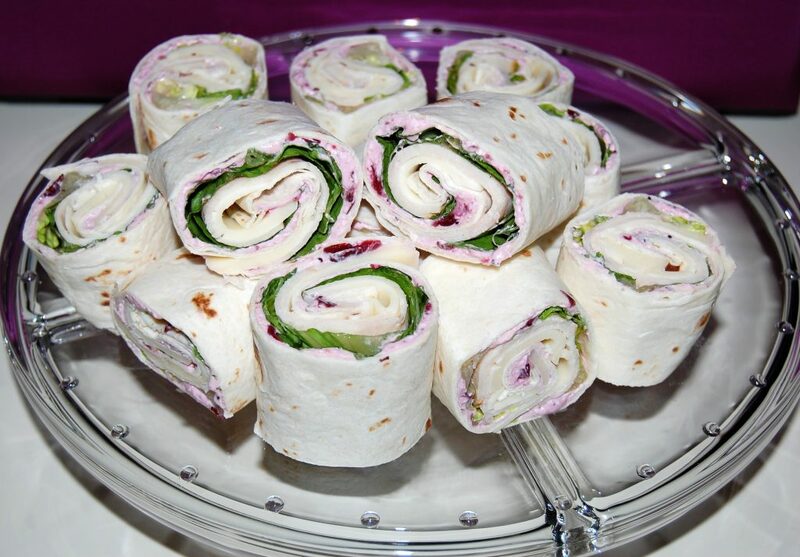 Cut roll-ups into 1 1/4 slices and arrange slices onto a serving platter.